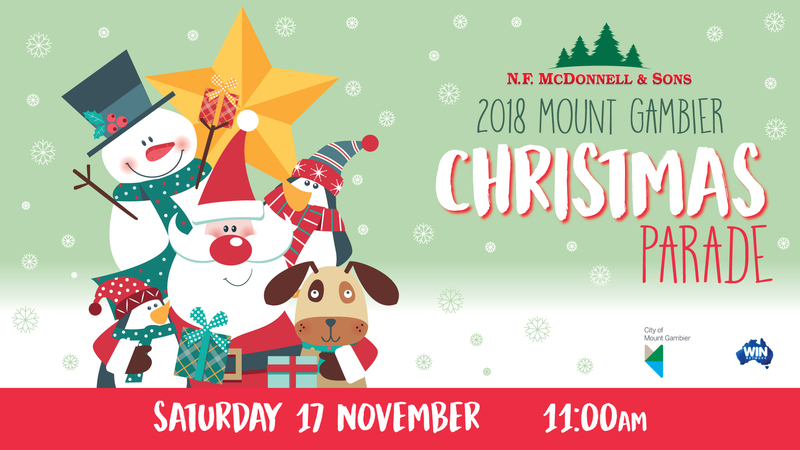 Entries are now open for the 2018 NF McDonnell and Sons Mount Gambier Christmas Parade. This year the parade is in its 59th year and will be held on Saturday 17 November 2018. With more than $3500 in prize money to be won, City of Mount Gambier is encouraging all community groups, sporting clubs, schools, businesses and individuals to fill in an entry form and get behind the festive event. There are 10 prize categories with the top prize of $750 awarded to the most outstanding entry. Other categories include best Christmas theme, best school entry, best club or community organisation entry, open category, best themed band, encouragement award and best non-city entry. A new category for 2018 is the best use of recycled resources entry, sponsored by Community Action for Sustainability (CAS). Mount Gambier Lions Club donate prize money for the best brass band award, while major sponsor NF McDonnell and Sons provide prize money for the other awards. “Community Action for Sustainability are offering a $250 cash prize for the entry with a focus on sustainability and the use of recycled materials,” Ms Richardson said. “We really appreciate the opportunity to make a contribution to making Mount Gambier a cleaner and greener community via this iconic event and look forward to seeing what entrants might produce from recycled materials,” CAS Secretary Jenny Cox said. All entries will be independently judged on criteria such as creativity, effort, visual appeal, energy, crowd engagement and creative use of recycled material. Entry forms can be downloaded from Council’s website www.mountgambier.sa.gov.au/christmasparade or a printed copy can be collected from the Mount Gambier Visitor Centre, Mount Gambier Library, Civic Centre or Main Corner Complex. Entries close on Wednesday 31 October 2018 at 5:00pm. The 2017 Most Outstanding Entry was awarded to Renal Christmas Bollywood Style by Mount Gambier and Districts Health Service.